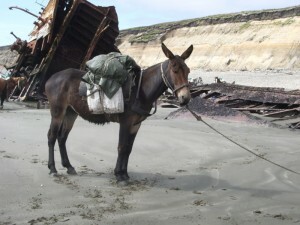 A mule wanders down a mountain trail alone, walking away from a known adventure location and toward town. What’s in its saddlebag? 1- The severed heads of a dwarf, elf and halfling. Each wears an earring, shaped like an owl. 2- A bag of 1,000 gold pieces. Three hours after they are spent or given to someone, they will vanish. 3- A bag of orange moss that cures disease when eaten. It also turns the eater bright orange for two weeks. 4- The chicken can talk, but it has only a chicken’s experience from which to draw. It can grant a minor wish, but the wish must be related in terms a chicken can understand, and will be granted in light of how a chicken sees the world. 5- A map leading to a library of inaccurate maps. Also, enough golden rings for all but one of the party members. 6- A large and ridiculous hat, folded and carefully tucked into the bag. When worn into any town or city, the residents will immediately make their own hats after the same fashion. This hat trend will last for one week after which the townspeople will angrily reject the hat trend and resent the original wearer (even if he or she has abandoned the hat as well). 7- Two small nuggets of adamantine (or mithril) ore. There are no adamantine deposits within a thousand miles, however. 8 – A brass horn, which can be played expertly by anyone who attempts to use it. 9- Seven ancient scrolls which contradict and in fact disprove the area’s prevailing faith. They cannot be destroyed by less than magical means by a 9th level or higher spellcaster. 10 – The battle flag of an ancient, long-gone empire. Within 2d12 days, 100 skeletal warriors will come to claim it. 11 – A Wandering Monster. That is, a monster from the random encounter table of the last adventure. It will climb out of the bag and if not attacked, will wander off. Where has this awesome blog been hiding all along? Added to my blogroll. Very nice posts, I was lost reading back through several posts.